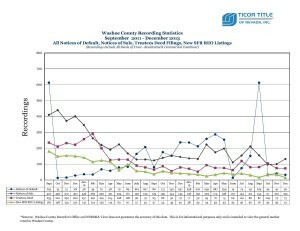 Thanks to Ticor Title for the December 2013 foreclosure statistics. Notices of Default (start of foreclosure) fell to 32. Notices of Sale (heading to auction at the courthouse) went up a little to 132. Trustees Deeds (sold at the courthouse or back to the bank) fell by 1 to 73. New REO listing fell in half to 15. Summary: More months of no inventory and a lack of good options for home buyers. The seller’s market will continue. Posted in For Buyers, For Sellers, Market Update and tagged reno foreclosure agent, reno foreclosure homes, reno foreclosure inventory, reno foreclosure stats. ← What’s Ahead In 2014 For Real Estate?